Running a home-based business brings numerous benefits. Since they’re operated from home by just one or two people there is no need to spend money on rent or lots of inventory. Many entrepreneurs see them as an easier way to make money compared to a traditional business. However, home businesses do come with a unique set of challenges. They often get just a few customers at the beginning. But as the popularity of a home-based business increases, orders start pouring in, especially as customers start coming back for more. 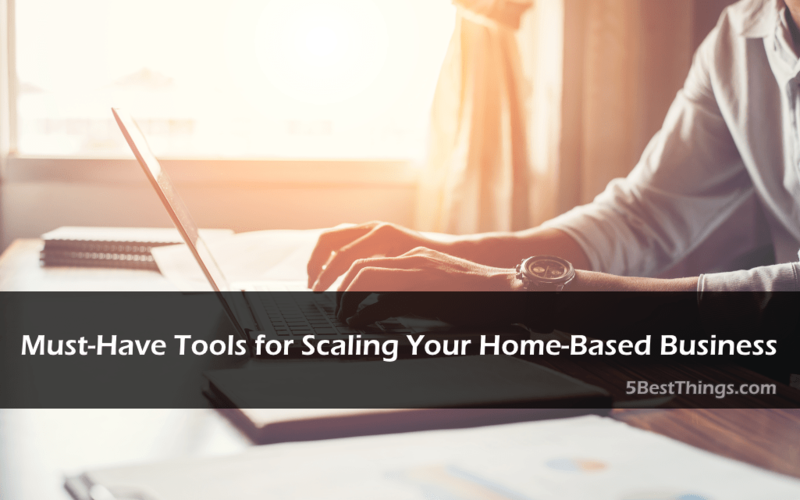 Home-based business owners who don’t adequately plan the growth of their enterprise are likely to fall victim to their own success. They often get overwhelmed with daily tasks, causing them to get stuck in place as they’re left with little time to deal with growing their business. This is why planning for future growth is important when running any type of business; no matter how tiny it may be at first. There are a variety of online apps and services you can use to help you stay on top of things as you scale up your business operations. Many of them either have a free edition available or are very affordable. This means you can get started with them right away, even if your business is still getting off the ground. 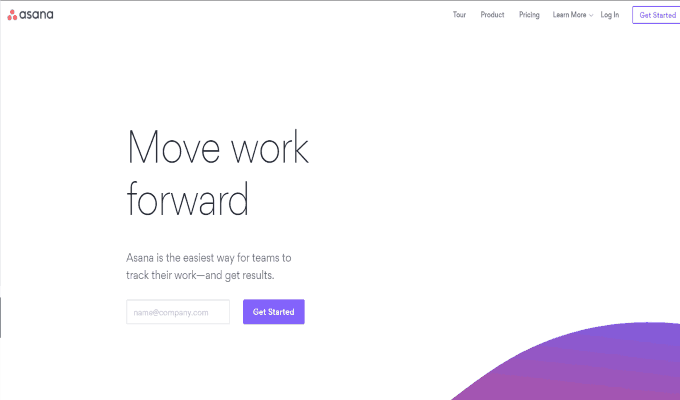 Asana is a cloud-based project management solution that enables you to get your work moving forward. It has features and functionality that you can take advantage of, even if you’re still the only person working at your business. It has a simple user interface that you’ll have no trouble figuring out, even though you haven’t used project management software before. With Asana, you can keep track of the status of your business projects from beginning to end. If you’re not undertaking anything special at the moment, you can use it as a very effective daily “to do” list. As your business starts taking off, it’s likely that you’ll start working with freelancers and temporary workers before you hire a permanent staff. This is where Asana can be truly beneficial. It allows you to assign tasks to different people and keep track of what everyone is doing. The free edition supports up to 15 team members, as well as unlimited tasks, projects and conversations, which should be enough for small businesses. As your business grows, you will need help with managing your finances. This is where accounting software becomes essential. A tool such as Quickbooks can help you track your business finances even if you’re not a pro at accounting. Quickbooks is an accounting program used by over 4 million businesses and individual entrepreneurs around the world. 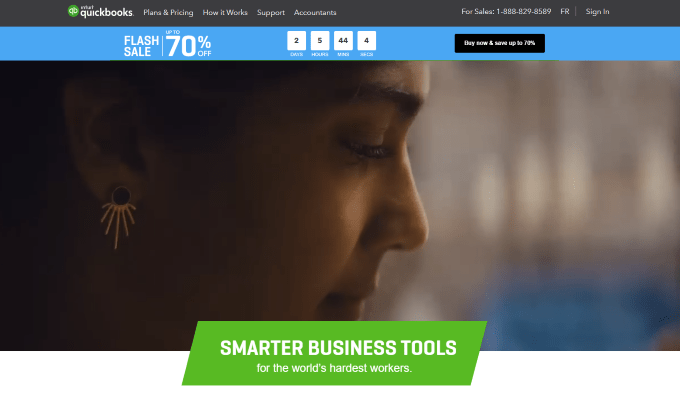 It’s one of the most popular accounting tools and has received many awards for its quality from tech publications. The “Simple Start” version is the most affordable, yet comes with a variety of functions any small business owner will find valuable. The app lets you send and track custom invoices, keep an accurate tally of your company’s income and expenses. You can also sync data from a variety of other apps, as well as online banking services. You can easily connect your bank account and keep track of your transactions. With the help of detailed reports, you can monitor your cash flow so that you know exactly how much your business is making. Many small businesses use Gmail to send and receive email. While Gmail has a variety of features that lets you keep track of your business contacts, managing your prospects, leads and customers can become a bit more difficult. This is where Streak can come in very handy. 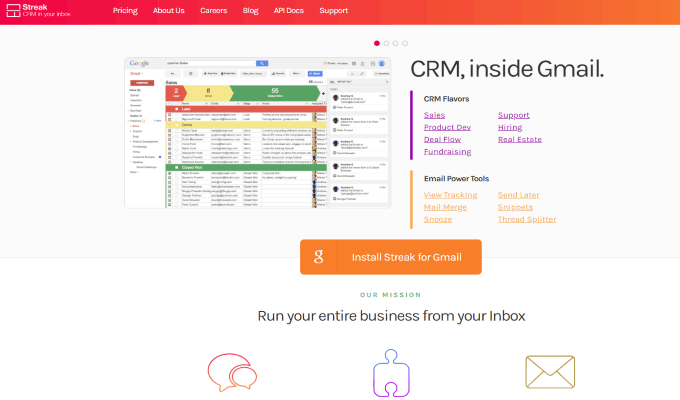 Streak is a CRM that integrates fully with the Gmail interface. It can also work with other Google Apps. This CRM is fully based in the cloud and doesn’t require you to install any additional software to make it work. You just need to download the extension and you can start working within minutes. You can access the CRM from any device and work on the go. Streak is great for keeping track of every conversation you’ve had with customers, partners and vendors. There’s also a sales pipeline feature that allows you to see the status of every deal you’ve made. The free version is great for business owners who need a simple CRM solution. It has the basic CRM features, email power tools and allows you to track 200 emails per month. The paid versions are more suitable for businesses looking for a fully-featured CRM solution. HubSpot is a complete inbound marketing solution that lets you draw in more people to your business and make it grow. Their platform provides you with an all-in-one cloud-based application you can use to perform many marketing tasks that would have required different pieces of software before. 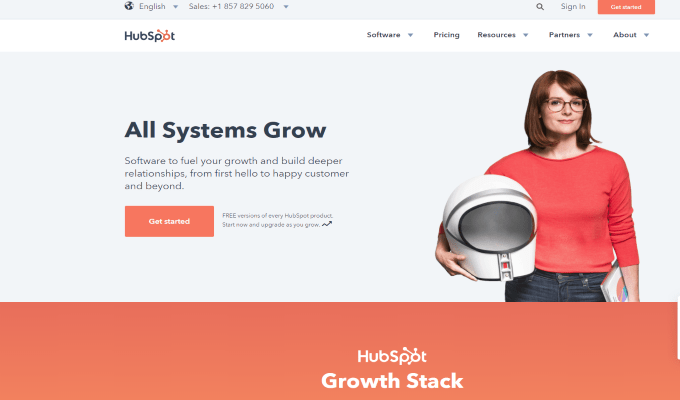 With HubSpot, you’ll have what you need to grow traffic to your website, convert a greater number of leads into paying clients and keep track of your sales funnel. If your business is still in the process of growing and you want to see what the platform can do for you, there’s a “Free Forever” edition you can get started with. The free version has many tools that let you convert visitors to leads and leads into customers. They include custom forms you can use to collect data on your website, an advanced contact management system, simple traffic and conversion analytics tools, as well as seamless integration with a variety of other online systems, like CMS, email and online form tools. The paid version gives you all of these features, as well as marketing automation, email marketing, social media and advanced analytics dashboards. Google Drive is one of the most popular and versatile cloud-based file storage solutions you can find online. With it, you can store any file in the cloud, whether it’s a document, photo or ZIP archive. When you get started, you receive 15 GB of free online storage. 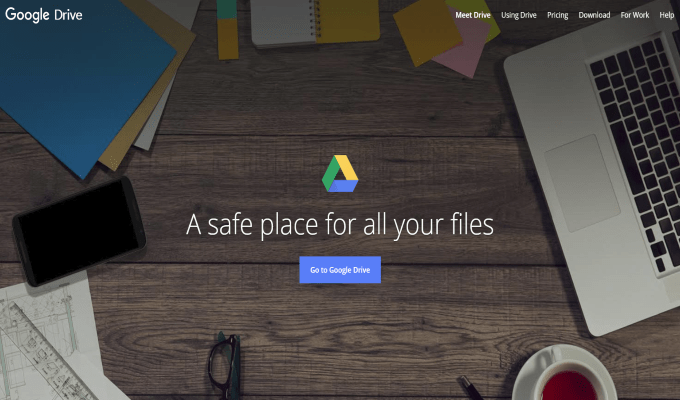 There are many advantages that come with using a powerful cloud-based file storage solution like Google Drive. As home-based business owners frequently use multiple devices to do their work, you can use it to ensure you have access to your data wherever you are. This is particularly practical if your business is growing and you’re meeting with potential investors or partners. Google Drive can also be used to share files and entire folders with others, without needing to deal with email attachments. Finally, it works very well as a file backup solution too. If you own a home-based business, it’s important that you adequately plan on growing your business in the future. This can be done by making sure you have the right tools for when you scale up. These apps give you the tools needed to keep everything under control as your business grows.